My mother-in-law gave me three large potatoes the other day. Since I discovered my love for sweet potatoes, I haven't eaten many "regular" potatoes. (Okay, I did make pizza with potatoes just a few days ago, but I bought them because they were so cute, and I had a particular dish in mind that I wanted to recreate...). Seeing the potatoes on my counter, I thought they'd be perfect for oven-baked fries. And that's what I made. 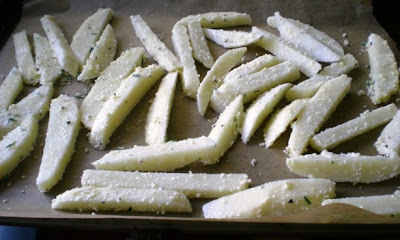 But I wanted the fries to be a bit more "interesting," so I added chopped rosemary and grated Parmesan cheese. I coated the cut up potatoes with olive oil and then added the cheese, rosemary, salt & pepper. Here is a picture of the fries before I put them in the oven. I baked them at 450 degrees for about 25 minutes. [Important: Please see my note at the beginning of this post regarding the oven temperature.] I turned them about three times while they were baking. The fries were part of our "unplanned" meal on Wednesday. 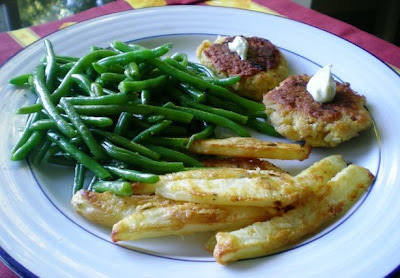 In addition to the fries, we also had salmon cakes, and sauteed green beans. Oh wow, those look delicious! i love sweet potato fries! I love sweet potato fries and butternut squash fries. I had not ever thought about adding parmesan on fries!! They turned out really good (I can tell by the crusty coating). THe rosemary is another great idea, I'm a huge rosemary fan. As of now my favorite fries are sweet potato with garlic, cumin, and pepper (random combination, I know!). The fries look like they turned out well. I love sweet potato fries, but I also like plain old fries coated in Old bay seasoning. I love oven fries like these, and rosemary is so great with them! They look delicious. they may be MY new favs! and of course some blogger LOVE to your salmon cakes...they are my men's favorite! I love any fries - yours look really tasty. Right now I'm digging butternut squash fries in a crazy way! Ok, this post and the last post on banana bread with Nutella are making me drool. These look so much better than any fry you could get in a restaurant. I can't wait to make them! After discovering sweet potatoes, I haven't been eating regular potatoes as much either, but those look phenomenal! Parmesan on fries sound yummy--I must try it! I adore fresh hot sweet potato fries. Mmm! I love sweet potato fries. Actually, I like any kind of fries. It's been a while since I've made some. I'll just had to buy me some more potatoes because I just used up the one ones I bought from the farmer's market. I love sweet potato fries too! I also like those little red potatoes, peeled in the middle and roasted with some rosemary and olive oil. Those don't totally count as fries, but are along the same lines! I love this combo of flavors! My only concern would be baking olive oil at 450, I think the smoke point is 375? You could probably reduce the temp and just bake a little longer. OK - sorry to be a food nerd, I've just started to learn more about the max heating temp of oils and that going above that can be harmful to your health, and your safety too - with flash points and oil bursting into flames. Well I know what I'm doing with my huge sweet potato tomorrow! 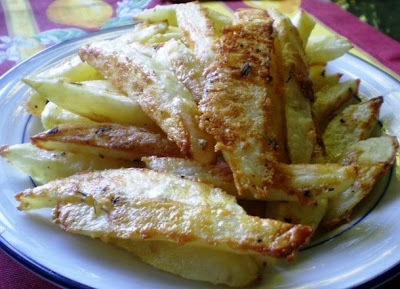 Love baked fries in olive oil, yumm!!! my fav fries are from a pub in downtown minneapolis. maybe it's not that the fries are so good, but the three dipping sauces they come with are AMAZING. i'm a dipper. chips and dip, fries and sauce, apple and caramel ... love it all! wow those are perfectly crisped up! I actually like these better than "Real" fries...yum! p.s. I havent had much potatoes since I started buying more sweet potatoes again too! Potatoes and rosemary are a duo that can't be beat. Love the piney smell that fills the house, too.